The difference between those sentences, E. M. Forster wrote, is plot, and what creates that distinction is character. Whether a book’s characters are real (like Robert Byrd’s Ben Franklin), imagined (like Rainbow Rowell’s Eleanor and Park) or something-in-between (like Jonathan Bean’s fictional re-creation of his family’s house-building), they are born of the imagination and made of words and pictures. Join the 2013 winners and judges of the Boston Globe–Horn Book Awards, The Horn Book, and the Center for the Study of Children’s Literature at Simmons College for the Horn Book at Simmons: Building Character, as we explore how characters get built, and how they reach out from the page to young readers in the process of building themselves. 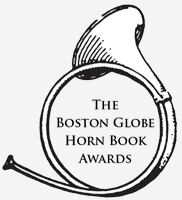 Registration to the Horn Book at Simmons grants you admittance to The Boston Globe-Horn Book Awards Ceremony the preceding evening! Celebrate the best in children’s literature at The Boston Globe–Horn Book Awards Ceremony on Friday, October 4th. Hosted by Roger Sutton, Editor in Chief, The Horn Book, you’ll hear captivating acceptance speeches from this year’s winners and immediately following the Awards Ceremony, join us for mingling and book signings at a reception hosted by the Center for the Study of Children’s Literature at Simmons College. Click here to see the full list of 2013 Boston Globe-Horn Book Awards winners and honor books and be sure to watch the exciting announcement of this year’s winners!